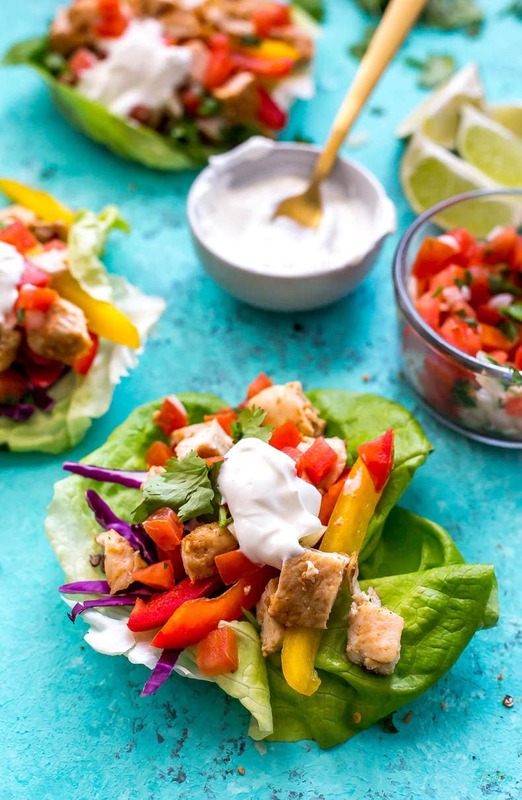 These Low Carb Mexican Chicken Lettuce Wraps are a healthy meal prep lunch idea for those busy work weeks - they're also a great way to get in an extra serving of veggies! Slice chicken in half lengthwise and coat with a bit of olive oil and taco seasoning. Add olive oil to large skillet over med-high heat. Add chicken and cook for 4-5 minutes per side until fully cooked through. Remove from heat and set aside. Meanwhile, mix together ingredients for pico de gallo. Prep veggies. When cooled slightly, cut chicken into cubes. Add veggies, chicken and pico de gallo to individual lettuce leaves. Top with sour cream (optional - don't add for Whole 30), then serve and enjoy!